How Long Does Hummus Last ? How long does hummus last ? And do you need to keep it covered ? Whether you like to make your own homemade hummus or prefer to simply buy it at the store, you may be curious how long you can store hummus before it goes bad. Hummus is a favorite food for many people. It can be a very tasty snack or a good accompaniment to many different main dishes. When you open it and leave it in the refrigerator hummus will generally look fresh for a few days. Once opened the top layer of hummus may start to go a slightly darker color. The answer actually differs somewhat depending on the type of hummus in question. Homemade hummus generally doesn’t last as long as the store-bought variety. This is because the same commercial preservatives aren’t used by people when making a homemade recipe. You can store hummus in your refrigerator for around one week. After this point, the hummus will begin to become stale and lose that delicious flavor that you enjoy so much. 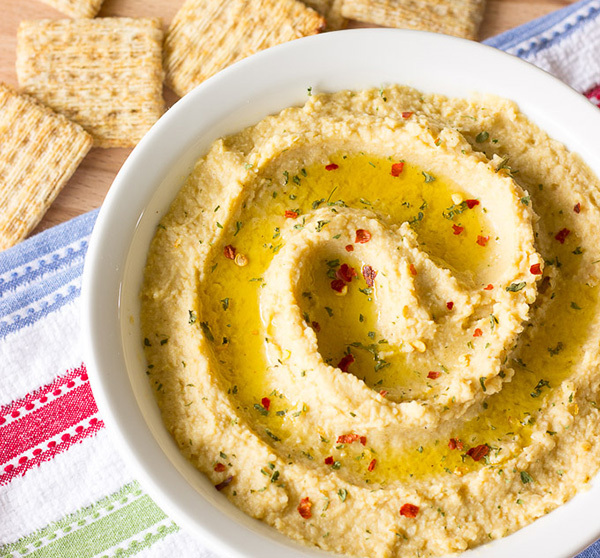 Store-bought hummus is able to store for a bit longer than the homemade. It should typically have a “best by” date printed on the package somewhere. This is a good general estimate of when it should begin to go stale. It’s not necessarily bad to eat it when it is a bit past that date but it won’t be at its maximum freshness. You should be able to continue to store the hummus in your refrigerator for a few days after the date has passed. It might not have the same flavor complexity once it isn’t as fresh but many people still find it to be quite good. Don’t keep hummus that is past the date on the package for longer than three to five days, though. It’s also good to know that freezing hummus is an option. If you’re into making homemade hummus, then this is really good news. For instance, if you’ve made way too much that couldn’t possibly be eaten before it goes stale, then you can simply freeze the remainder and finish it another time. This works very well and is a simple solution to the problem. You need to know how to freeze hummus properly, though. It’s important to have a good container that is safe to use in your freezer. It should have an airtight seal or else the hummus isn’t going to be protected well. Some people also recommend drizzling a small amount of olive oil on your hummus before freezing it as a method to keep it fresher. Storing store-bought hummus in this fashion is also possible. It works best with unopened hummus but as long as you can reseal the hummus in an airtight container, everything will go just fine. Freezing the hummus will allow it to be stored for between six and eight months. This is plenty of time to work up an appetite and decide to polish the rest of the hummus off. It should also be noted that freezing the hummus can change the flavor of it a bit. It won’t necessarily taste completely different when you thaw it out and eat it but it won’t be quite the same. It will taste as if it has lost a bit of its strength perhaps but it’s possible that you may not notice it. Regardless, the option to freeze hummus is very useful and can help you to not let a good batch go to waste. « Do Pickles go Bad ?